It's that time again, time to winterize the house. Our house is very old which means DRAFTY! I measured the width of the window and the depth of the area where the draft stopper would sit and cut scrap fabric according to those dimensions. I found the best fabric to use was a flannel. Basically I made a long rectangle, sewing around the 3 sides, leaving one end open. I turned it inside out and then filled each draft stopper with unused, recycled, pine cat litter. Once filled, I hand sewed the opened end shut. I am amazed on how well they work. 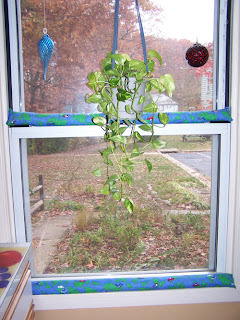 These would also be great for renters since most windows are standard sizes you can take them with you when you move. I found you from the Greenbelters site and will soooo be making these this weekend for my drafty GHI frame! Thanks so much! Thanks for letting me know about your blog entry on the draft stoppers. The kitty litter is a great idea. I had bought aquarium gravel--will try that first, but if it doesn't work, I'll try the kitty litter. I figured I wanted something heavy so that they would stay in place, instead of fiber fill or packing peanuts. Pine kitty litter is great. When I was little, my dad used it in our cat's litter box. Then he'd put the used litter on his forsythia bushes, and they were the biggest in the neighborhood (natural fertilizer! ).